MISO (Managing Information for Sequencing Operations) is an open-source Lab Information Management System (LIMS) originating from EI, specifically designed for tracking next-generation sequencing experiments. Sequencing centres differ not only in terms of their scale and output, but also their requirements for information management. Sequencing platforms are becoming more accessible, and the efficient storage of genomic metadata is vital for large and small sequencing centres alike. Off-the-shelf solutions are often very expensive and not cost-effective for the smaller centre. Furthermore, support contracts are often required, and the extensibility of these systems is not in the hands of the metadata generators. In terms of implementation, as well as the desire to tailor an information system in-house, data formats can change and platforms can evolve rapidly. These are valid concerns for both large centres characterised by high-throughput data production and smaller scale laboratories with constrained expenditure for IT solutions, and potentially project specific metadata requirements. 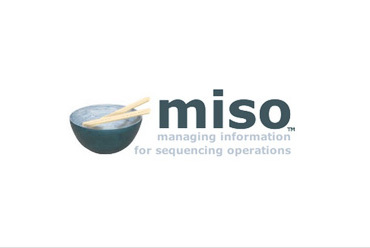 Hence, we are developing MISO, an open-source LIMS for recording sequencing metadata. We are using freely available tools that are industry standard, well documented, and easy to set up on minimal hardware. As a bare system, MISO can store relevant metadata based on a wide array of NGS sequencing platforms (e.g. Illumina GA, HiSeq, MiSeq and NextSeq, Roche 454, ABI SOLiD, PacBio RSII and Sequel, and Oxford Nanopore) and public repository data submission schemas (e.g. the European Nucleotide Archive at EMBL-EBI), and has many features common to bespoke and proprietary LIMS, such as secure authentication, fine-grained access control, barcode tracking, and reporting.